Finely chop green onions, separating white part from green part. In 10-inch nonstick skillet, cook pork over medium-high heat 4 to 5 minutes, stirring occasionally, until no longer pink; drain. 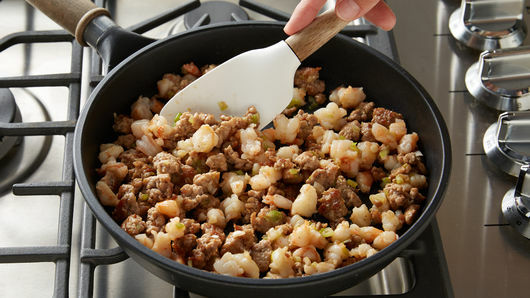 Stir in shrimp, white parts of green onions, 1 tablespoon of the oyster sauce, the salt and pepper. Cook 1 to 2 minutes or until shrimp turn pink. Remove from heat. 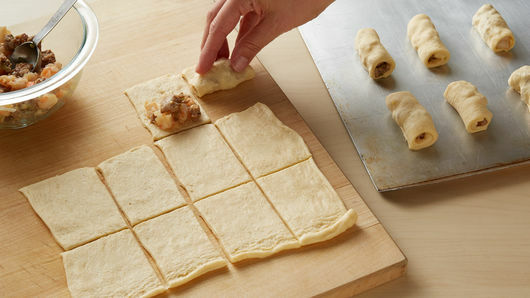 Unroll dough onto work surface; press or roll to 12x9-inch rectangle. Using pizza cutter or knife, cut rectangle into 4 rows by 4 rows to make 16 rectangles. Spoon rounded tablespoon pork mixture onto short side of each dough rectangle. Roll up tightly; place rolls seam side down on cookie sheet. Brush with remaining 1 tablespoon oyster sauce. Bake 12 to 15 minutes or until deep golden brown. On each serving plate, place 1 lettuce leaf and 1 tablespoon red cabbage. Top with 1 pork roll. 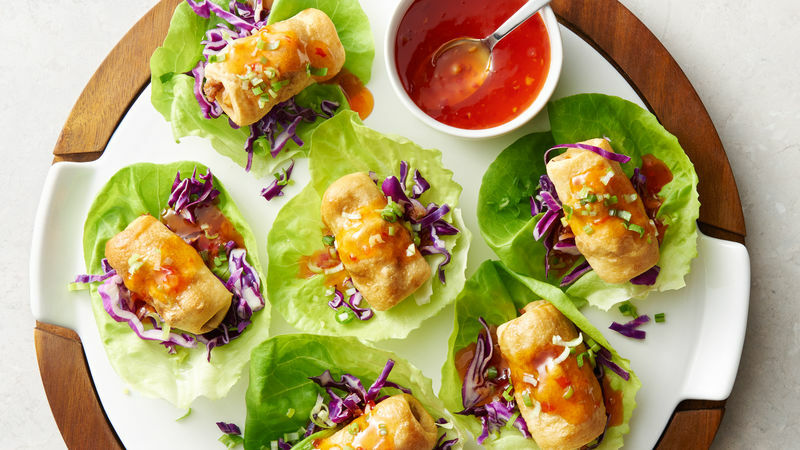 Spoon 1 1/2 teaspoons sweet-and-sour sauce over each roll; sprinkle with remaining green onions. Serve with remaining sauce. In 1948, my family had just arrived in Chicago, Illinois—a long way from Kybartai, Lithuania. We survived World War II, ending up in an American-occupied zone in Germany in a displaced persons camp. Finally allowed to immigrate to the United States, we arrived in a new country that had a new language, new customs and new foods. Growing up, I didn’t experience fast foods. Instead, I remember my mother teaching me how to make stuffed cabbage and “kuldunai” (pierogies) with pork and onions. This was our comfort food. Comfort food, to me, is something you grow up loving, something your mom made and reminds you of home and family. Food was how I experienced the world, both old and new. Food was how I knew I was loved. And now, in 2018, immigrant food is “trendy.” Chefs around the country have elevated the foods of immigrants like my mother. So, I deconstructed my mother’s “kuldunai” using Pillsbury™ crescent dough sheets and to cut out rectangles. I stuffed them, rolled them and baked them. Then I nestled them in a lettuce cup, topped with shredded cabbage (homage to my mom’s stuffed cabbage rolls) and drizzled with a tongue-tingling sauce. My family tried them and the response, “Hey, these are great” and my granddaughter shot me a thumbs-up.